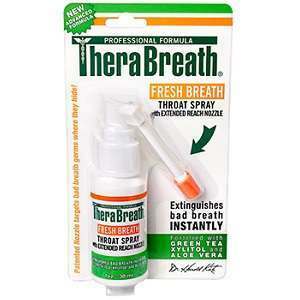 TheraBreath Fresh Breath Throat Spray is an easy-to-use oral treatment to be sprayed at the back of the tongue to neutralize bad breath and mouth odor. It claims to target the source of bad bacteria in the mouth. This product does not contain any alcohol, saccharin, sodium lauryl sulfate, and benzalkonium chloride. After brushing teeth, TheraBreath recommends placing the special ‘extinguisher’ nozzle on the very back of the tongue and spraying 1 to 2 squirts at the base of the tongue and throat, followed by one long spray across the tongue as you remove the nozzle. The product can be used as often as desired or needed. TheraBreath places no restrictions on use, but anyone suffering from an open wound in the mouth should consult a doctor before using this product, as should those who are pregnant or breastfeeding as the effects have not been tested on children. There may be a numbing or tingling sensation right after use caused by the menthol in this product, and the presence of zinc gluconate in this product may cause minor stomach upset in some people. There appears to be no serious health risks associated with either temporary or prolonged use, either listed on the website or reported through user reviews. The manufacturer’s website advertises a pack of three 1oz bottles for $22. Individual bottles can also be purchased for $8.50 through Target. The company website offers a number of different coupons, and ordering a recurring shipment through Amazon may also save money over time. TheraBreath offers a 100% money-back guarantee on all of its products, including its Throat Spray. To qualify for this, a product must be returned within 30 days from purchase, along with a reason for return and the unused portion of the product. Customer reviews are extremely positive, and highlight how well the product works, even with continued use, so it is clear that TheraBreath strives to create a high-quality product that really works. The list of natural certifications and ingredients, combined with the very positive customer reviews make this product a good choice for those who suffer from continued problems with bad breath. The one main downside is price. It is unclear how long each 1oz bottle lasts, so frequent use could become quite expensive over time. Tim McClure	reviewed TheraBreath Fresh Breath Throat Spray	on January 2nd	 and gave it a rating of 3.5.